The northeastern United States received copious amounts of precipitation from the four nor’easters that blasted the region this month. Much of the rest of the country, however, has been parched. According to the latest report from the U.S. Drought Monitor, 31% of the nation is dealing with some form of drought. While this number represents a slight improvement for California, the situation in the southern plains and the southwest has been getting worse. Parts of the Texas Panhandle, western Oklahoma and southwestern Kansas are in exceptional drought, the worst possible category. Drought conditions have also been building in parts of the southeast. In Florida, according to the state’s Forest Service, dry conditions have fueled more than 1000 wildfires across the peninsula since the beginning of the year. 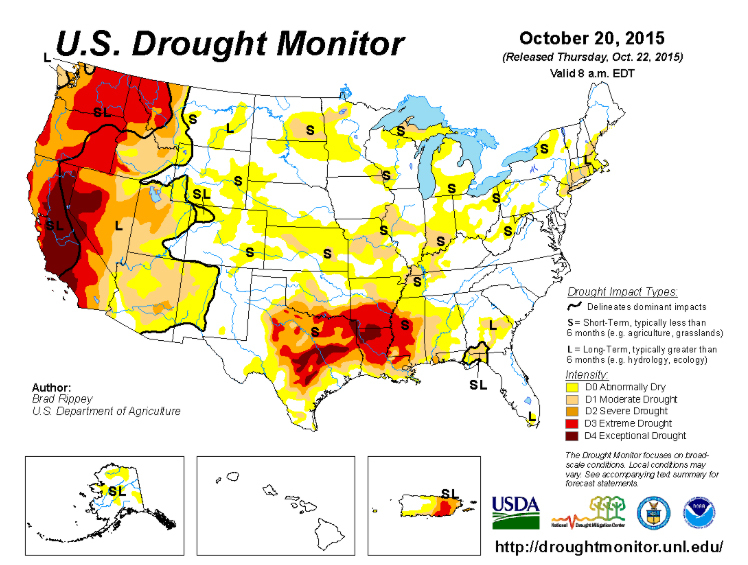 The US Drought Monitor is a weekly publication produced by a partnership of government agencies, including the National Drought Mitigation Center, the United States Department of Agriculture, and the National Oceanic and Atmospheric Administration. December felt like a weather roller coaster in New York City this year. We had highs that ranged from a cold 27°F to a relatively balmy 60°F. The warmth won out in the end, though. 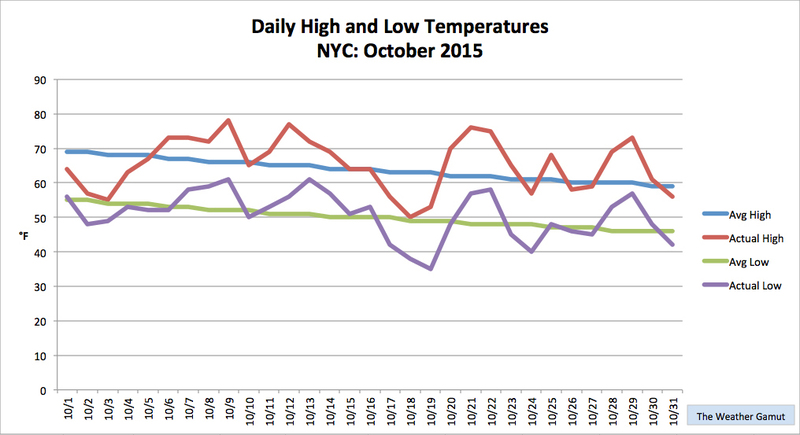 The city’s mean temperature for the month was 38.4°F, which is 0.9°F above our long-term norm. That makes December 2016 the Big Apple’s 18th consecutive month with an above average temperature – its longest streak on record. In terms of precipitation, December was mostly dry. In all, we received 2.89 inches of rain, which is 1.11 inches below normal. Snowfall was also relatively scarce with Central Park reporting 3.2 inches for the month. The city usually receives 4.8 inches of snow in December. As a result of the this paltry precipitation, NYC remains in a moderate drought according the latest report (12/29) from the US Drought Monitor. According to the latest report from the U.S. Drought Monitor, 41% of the nation is in some form of drought. Many areas in the south and northeast are listed as abnormally dry or experiencing moderate drought. But, it is the western states that have been particularly parched. One of the hardest hit states is California, which is now in its fifth consecutive year of drought. In fact, 100% of the Golden State is currently experiencing some form of drought with 43% in extreme drought. These exceptionally dry conditions have provided the fuel for an early and explosive start to the region’s wildfire season. Deprived of water, trees in California have not been able to produce the sap that helps protect them from insect infestations. This has left them vulnerable to attack by bark beetles, especially as the temperature warms. Together, the drought and these insatiable insects have increased the rate of tree mortality in the state over the past few years. According to a recent survey by the U.S. Forest Service, 66 million trees have died in the Sierra region of California since 2010. That is an increase of 26 million since the last count in October. Sadly, as the drought continues, more trees are expected to die, further elevating the risk wildfires. This autumn season has been marked by a number of intense rain and flooding events across the US, from South Carolina to California. Drought, however, continues to plague large sections of this country. According to the latest report from the US Drought monitor, 58.96% of the nation is in some form of drought. Many areas in the mid-west and the northeast are listed as abnormally dry or experiencing moderate drought. But, it is the western and southern states that have been particularly dry. In California, despite some unusually heavy rain recently, the long-term drought continues. In fact, 99.86% of the state is experiencing conditions of moderate drought or worse, with 46% in exceptional drought – the worst possible category. These extremely parched conditions have helped fuel an explosive wildfire season across the Golden State. As discussed in an earlier post, the multi-year drought in Texas came to an abrupt end this past spring with intense rainfall and catastrophic flooding across the region. Over the summer, however, drought conditions returned. Developing fairly quickly, this is known as a flash drought. As of this week, 65.25% of the massive Lone Star State is in some form of drought and 21.40% is in extreme drought. That is serious weather whiplash!